Hello! Hope your week is off to a good start! Mine is because I actually got to do some crafting today... yay! 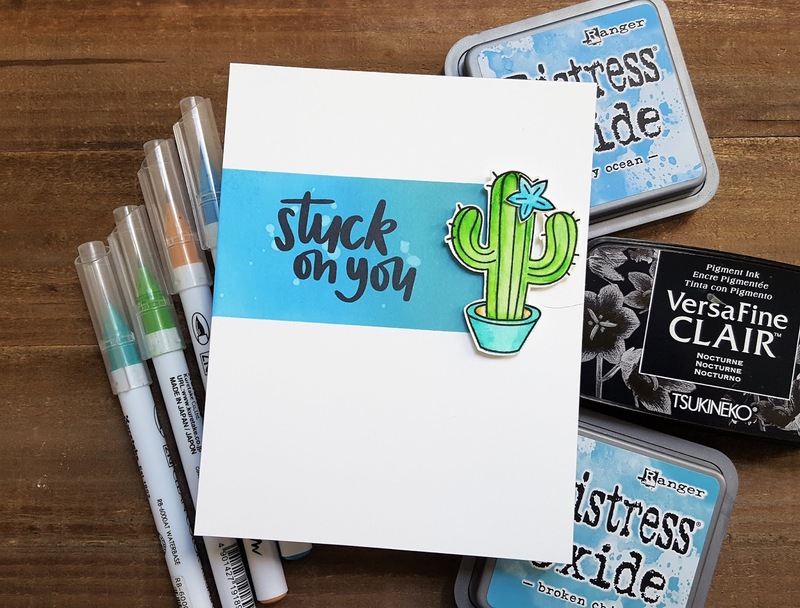 I made a card for a design team commitment and then a whipped up a quick card for the current Time Out challenge that I will also be submitting to the Simon Says Stamp Wednesday challenge of anything goes. I have had a Stampin Up! set called Colorful Seasons for quite sometime now and have not gotten around to making anything with it... hmmm... 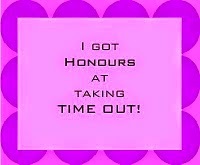 I seem to say that a lot, lol! Anyway, when I looked at the Time Out inspiration photo it made me think of that set and the dies that go along with it. I pulled out both and then got stumped (it happens a lot, lol!). 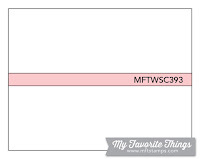 So I grabbed my Stampin Up catalog and flipped to the page that the stamp set can be found on and there I saw a card that was made using the set... so I shamelessly copied it! Well... not totally. 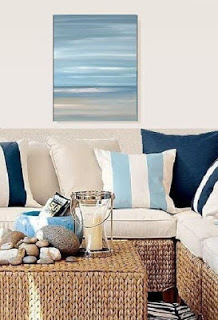 I pulled colors from the painting hanging on the wall in the photo, as well as from the wicker table that sits in front of the couch for my card and created a little beach scene. The sand was created by using a piece of thin cork that I have had for ages. Finished off the scene with a little iced drink and then sentiment. Things are a little crooked in my scene, but honestly... a beach isn't exactly straight and level and when you put your chair in the sand it is going to lean to one side or the other, lol! Hello...stopping in with a couple of cards I made using Altenew floral stamp sets. 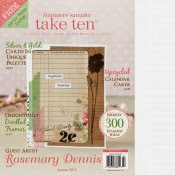 Altenew makes the most beautiful floral stamp set and I have managed to purchase a few sets to add to my collection. First up is a card that I made using the Altenew Inspiration color challenge and probably my favorite Altenew stamp set: Beautiful Day. I decided to try some coloring on a light gray cardstock (SSS fog... my favorite light gray) with my Prisma color pencils. I'm still working on my coloring skills, but I think my flower turned out pretty nice. 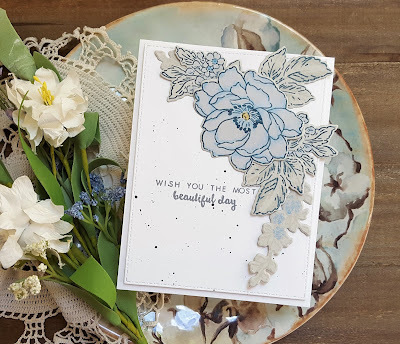 I stamped the flower with VersaFine CLAIR Twilight ink and colored the image with a light blue and then went in and added shadows with a medium blue. For the leaves I stamped the outline image in the Twilight ink and then added a single layer of detail using Simon Says Stamp Fog ink. One of the little flower clusters was stamped with the Twilight ink, as well, and then I added a touch of color with the same two blues used on the main flower. The final image was stamped with the Fog ink and then color added to the image with the medium blue. Before removing my flower from my stamping tool and after I had finished coloring it I restamped it with the Twilight ink. Everything was die cut with the matching dies. 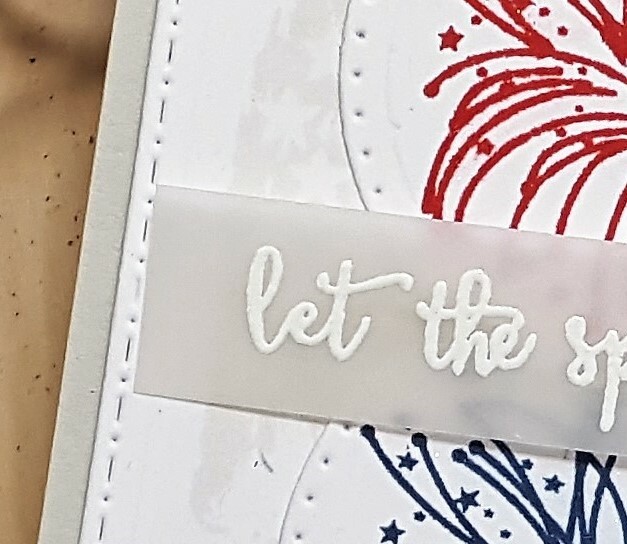 I arranged everything to figure out where to stamp the sentiment and then stamped it with VersaFine CLAIR Morning Mist. All the pieces were removed and the panel was splattered with some black watercolor. Once that was dry I adhered all the pieces and adhered the piece to a white cardstock base. Love how this card turned out. Going to add this to the Simon Says Stamp Wednesday challenge of anything goes. 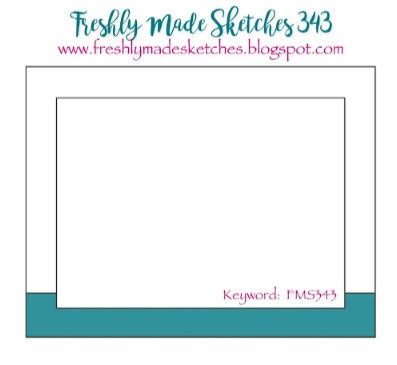 My second card is for Freshly Made Sketches and Color Throwdown. 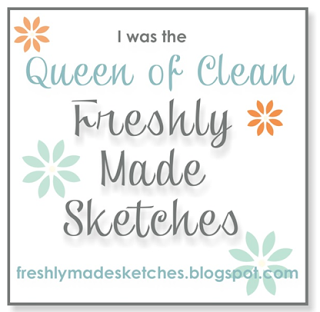 I was so excited to see my card from last week (also created using Altenew stamps) chosen as the top pick at FMS... it is fun to be the "queen of clean"! Thanks so much, Linda! 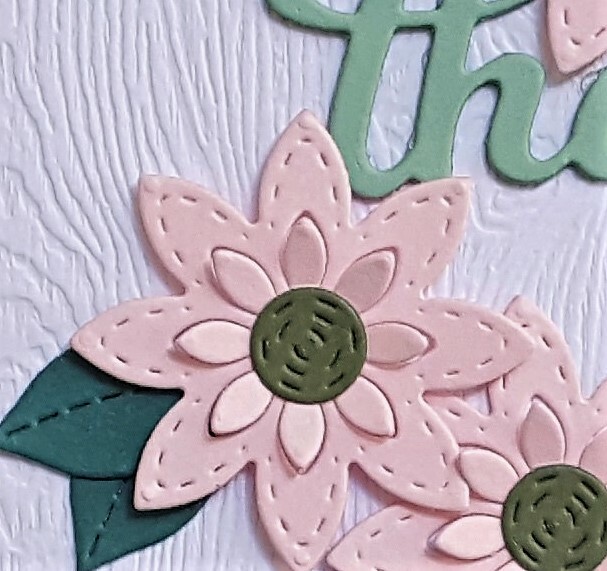 For this card I used the Altenew BAF Chrysanthemum stamp set. I have had this set for ages and have been wanting to make something with it, but as with so many things in life I never found the time (so sad!). 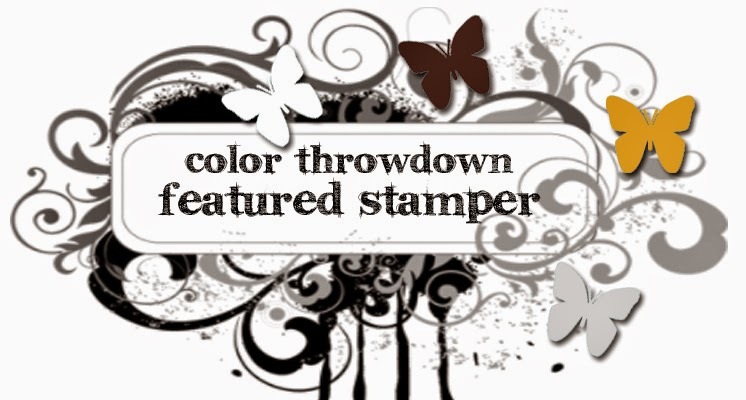 To stamp the flower I used the Altenew Red Cosmos ink collection (I have the mini cubes). Love, love, love how the flower turned out! The leaves were stamped with the Altenew Field Greens ink collection (also minis). 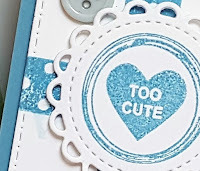 To bring in the gray I die cut a square using a Reverse Confetti die from a light gray cardstock. I stamped the sentiment using VersaFine CLAIR Nocturne ink and then arranged the flowers and leaves. White cardstock was die cut and then the square/flower piece adhered. I also love how this turned out... simple, but clean, crisp and classic! 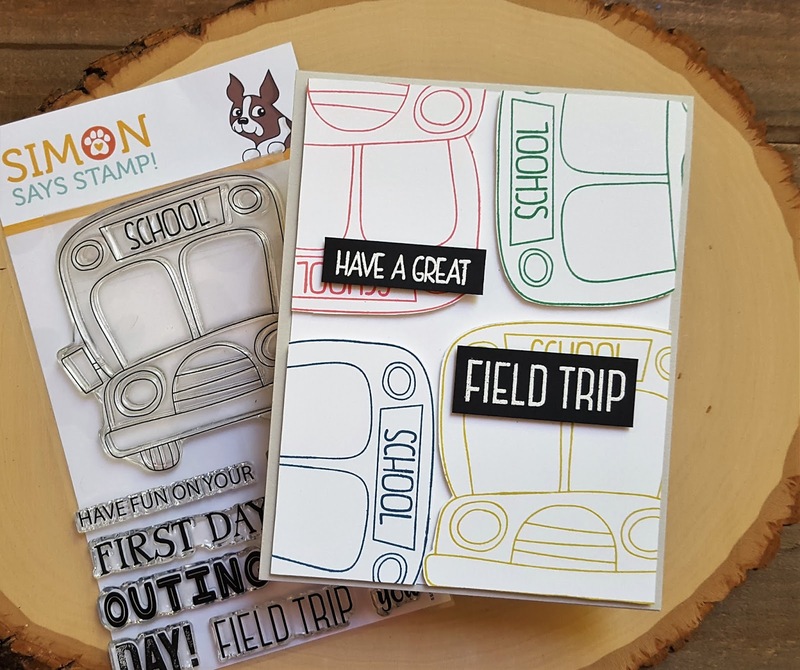 simon says stamp friendly frolic new release! Hey everyone! 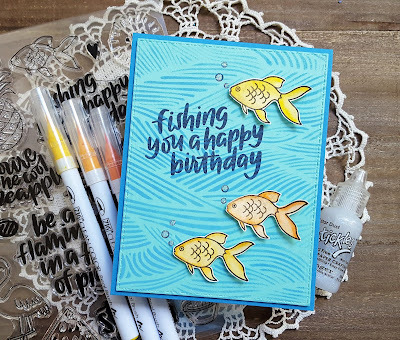 I'm popping in with a couple of cards that I made using one of the items from the Simon Says Stamp Friendly Frolic new release that is now available exclusively at Simon Says Stamp. The set I'm using is called School Bus Messages. There is a matching die available, too. 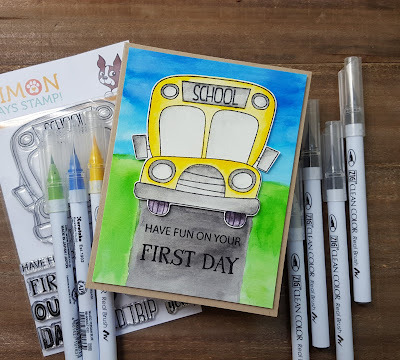 For my first card I did some watercoloring to create a fun back to school card. I stamped the bus on watercolor paper with VersaFine CLAIR Nocturne ink and then watercolored it with my ZIG Clean Color Real Brush makers. After I finished with the bus I did some simple watercoloring to create a background scene for my bus. Once the bus was dry I trimmed it out and popped it up on the dry watercolored background. 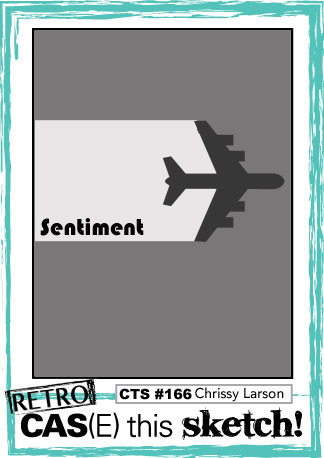 The sentiment was then stamped using the Nocturne ink. I'm going to add this to the Simon Says Stamp Wednesday challenge of anything goes. 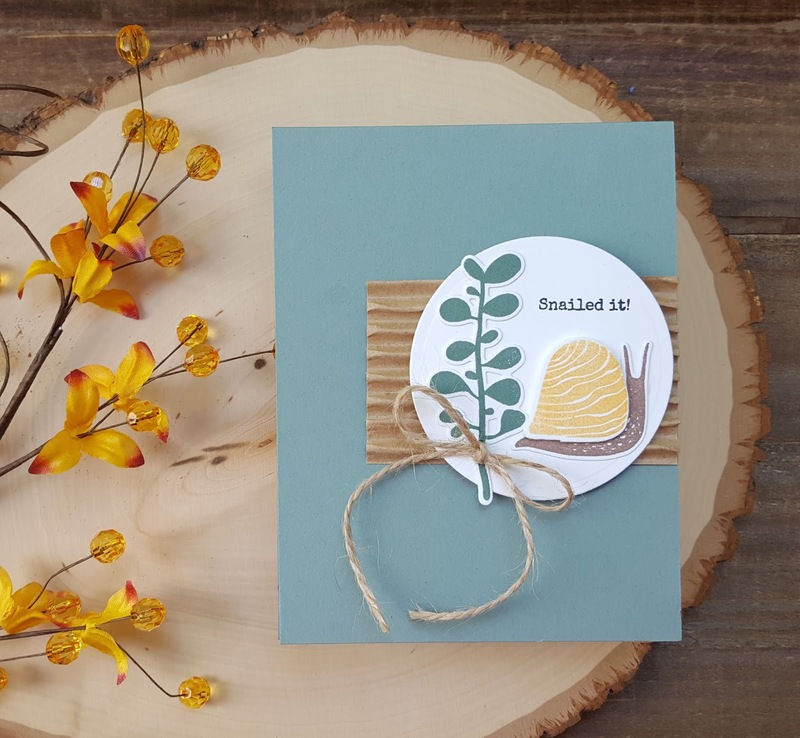 For the second card I created a clean and simple design that could be used to celebrate a child's first field trip. 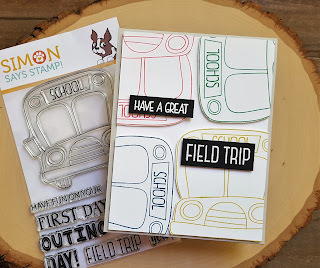 I stamped the bus four times using the following VersaFine CLAIR colors Twilight, Golden Meadow, Tulip Red and Green Oasis on white cardstock. I then trimmed out all the buses and arranged them on a trimmed down piece of white cardstock. In order to make the buses fit better I did trim off the mirrors. Once I had a good arrangement I adhered all the buses with foam tape. I then settled on a sentiment that I embossed in white on black cardstock, trimmed out and adhered as you see. I love the fun graphic look of this design. 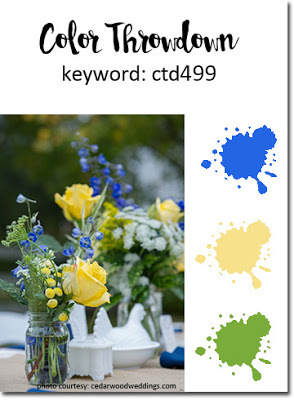 I think it would be fun to create this same card using cardstock in the primary colors of yellow, blue, red and green. 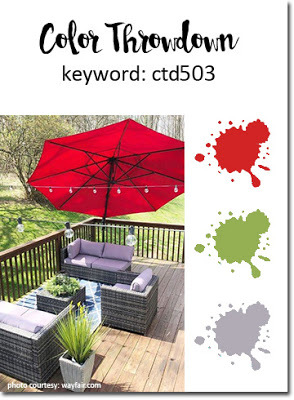 Going to add this to the current Word Art Wednesday challenge. 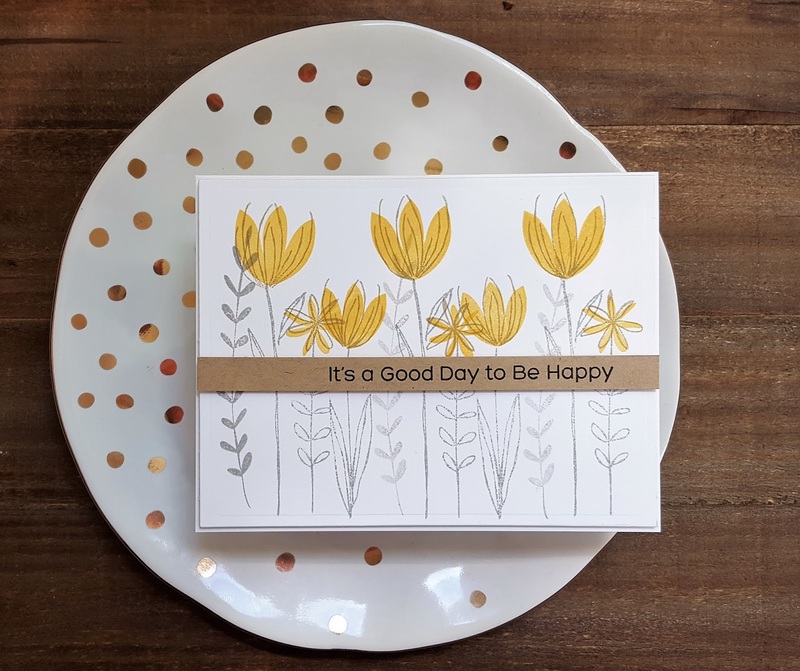 Hope you have a wonderful day and don't forget to check out the new Friendly Frolic release at Simon Says Stamp. There are tons of fun new products! Hope you will head over to the AJVD blog to see the full card and to let me know what you think. Have a wonderful day! Hello there! I got to make a card today... YAY! Sometimes that is a hard thing to do in my house. I have to craft in my kitchen which is connected to my family room. Now that it is summer and both boys are home that means someone is playing a video game at some point during the day in the family room. When that happens pretty much all desire to make something goes out the window. I was determined to not let that bother me today and it worked! It also helped that I had the idea as to what I wanted to make firmly planted in my little head, lol! I have had the Altenew Trigonometry stamp set for ages and have only used the happy birthday sentiment in the set. 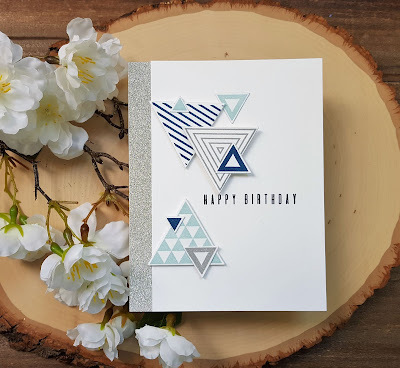 When I saw the color combo for this month's Altenew Inspiration challenge I immediately knew I wanted to make my card using the Trigonometry set to create a masculine birthday card. 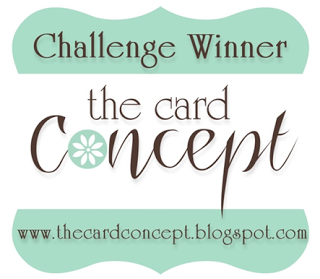 The sketch from Freshly Made Sketches provided the layout and I was able to create my card! I'm also going to add this to the Simon Says Stamp Wednesday challenge to use a die and/or punch. I picked out three large images from the set that I wanted to use and stamped them in the blue, light blue and gray colors. I used a small triangle image and a medium one and all three colors to stamp those as well. All the images were die cut and then arranged on the cardstock panel so I could figure out where to stamp the sentiment. 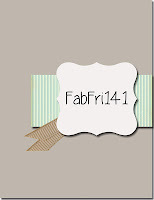 I added a strip of silver glitter cardstock to one side. Hopefully the guy who gets this won't mind that. I adhered the cardstock panel and then all the triangles using various heights of foam dots. Another clean and simple design... I seem to be on that kick lately. Hope you will take the time to head over to the AJVD blog to see the full card and to let me know what you think! Have a great day! Hey there! 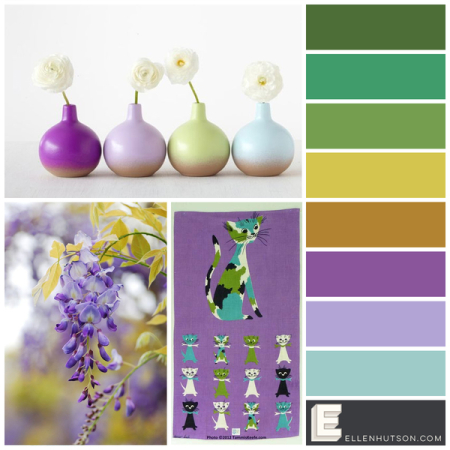 Popping in with a last minute card for the Ellen Hutson June Color Trend challenge. For my card I focused on the top half of the palette and used the fun EE Snailed It stamp set to create a rustic looking card. 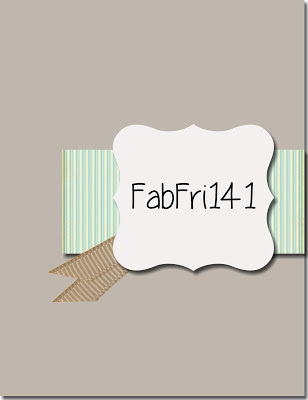 The layout for the card comes from the current Fab Friday challenge - a sketch. 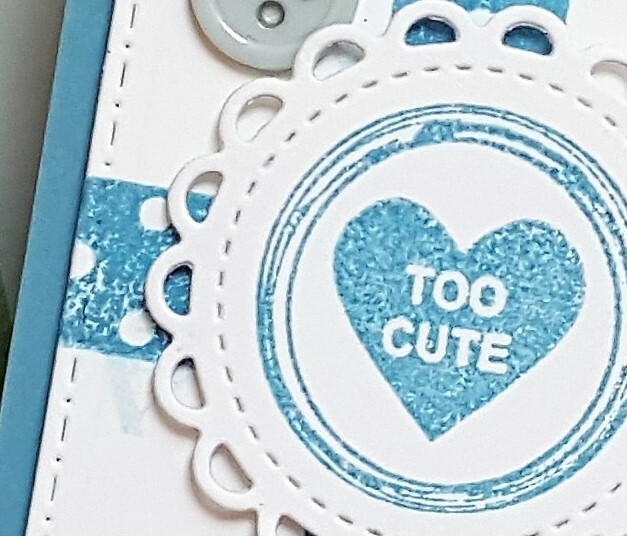 I stamped all the images and die cut them with the matching dies. I used some corrugated paper for the bottom piece in the sketch and then die cut a circle for the top piece. 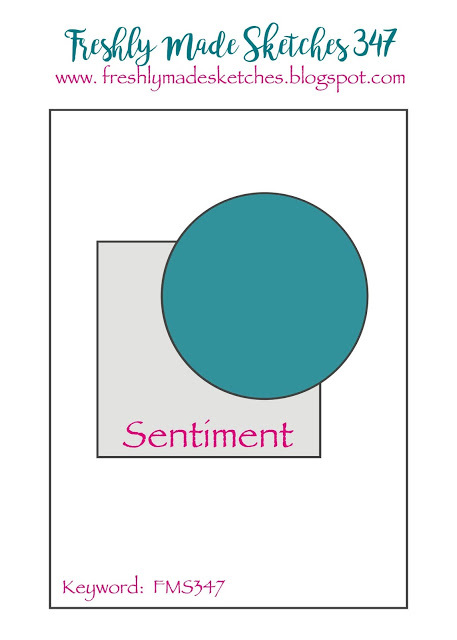 I placed the circle in my mini MISTI, arranged all the images and then stamped the sentiment. I finished things off with a bow tied from some hemp twine. Another clean and simple design. Seems like that is all I'm capable of right now, lol! Hello! 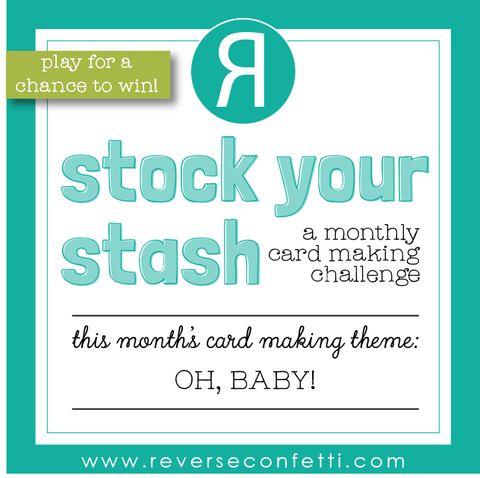 Popping in with a card that I made for a few challenges: Freshly Made Sketches and Reverse Confetti Stock Your Stash challenge. 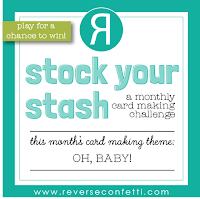 When I saw this month's Stock Your Stash challenge I didn't think I would be able to play along as the theme is baby cards and my collection of Reverse Confetti stamps don't include many with a baby theme. 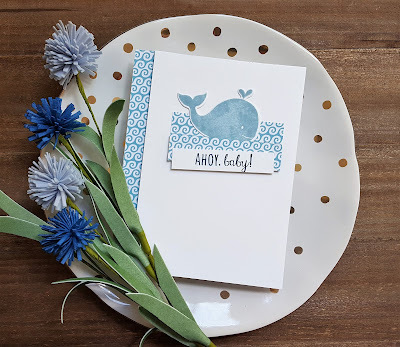 But then I saw RC design team members Deanne's super cute card using the whale from the Seaside set and I realized that I have that set... YAY! Thanks for the inspiration Deanne! My niece is going to be having a little boy in November and using the whale is perfect for a card for a baby boy! I have some fun Belle Carta Summer Splash patterned paper and one sheet had a waves pattern on it. I used that for the strip seen on the side of the sketch, as well as for the little ocean that the whale sits on. I did have a hard time finding an ink that worked well with the aqua color in the patterned paper, but finally settled on a aqua blue ink from Hero Arts. I cut apart the "ocean" so I could pop that up over the little whale. The sentiment was created by using the word ahoy from the Seaside set and the word baby from the Beautiful Banners set. I had to mask off portions of each stamp to create my sentiment. That was done using VersaFine CLAIR Twilight ink. A sweet clean and simple design! 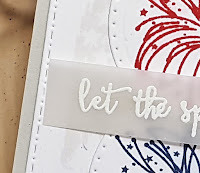 I'm sharing one final project using the new PRS stamp set called Little Things. 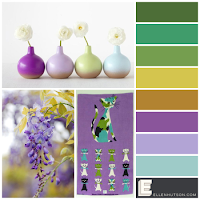 I hope you will head over to the blog for a look and to let me know what you think! Have a wonderful day! Hey there! I made a card... and it was just for fun and for a few challenges! 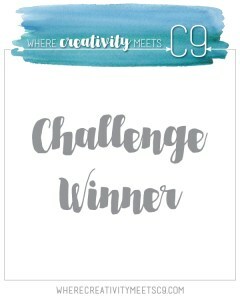 This week's sketch over at My Favorite Things is a super simple one and since I haven't had the opportunity to play along with any of their challenges in awhile I decided to combine it with the current Color Throwdown challenge to make my card. Stamping, plain and simple, is one of my favorite things to do, but when it comes to arranging floral images to create a scene and I'm not using die cuts I really struggle. 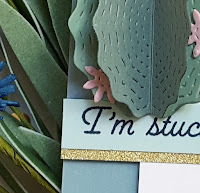 So I recently decided that I would start using inexpensive white cardstock that I purchased months ago to work with different stamps to build scenes until I got one that I was willing to commit to stamping on my good white cardstock. Best thing I ever decided to do! The end result this go round was my card for the above mentioned challenge. 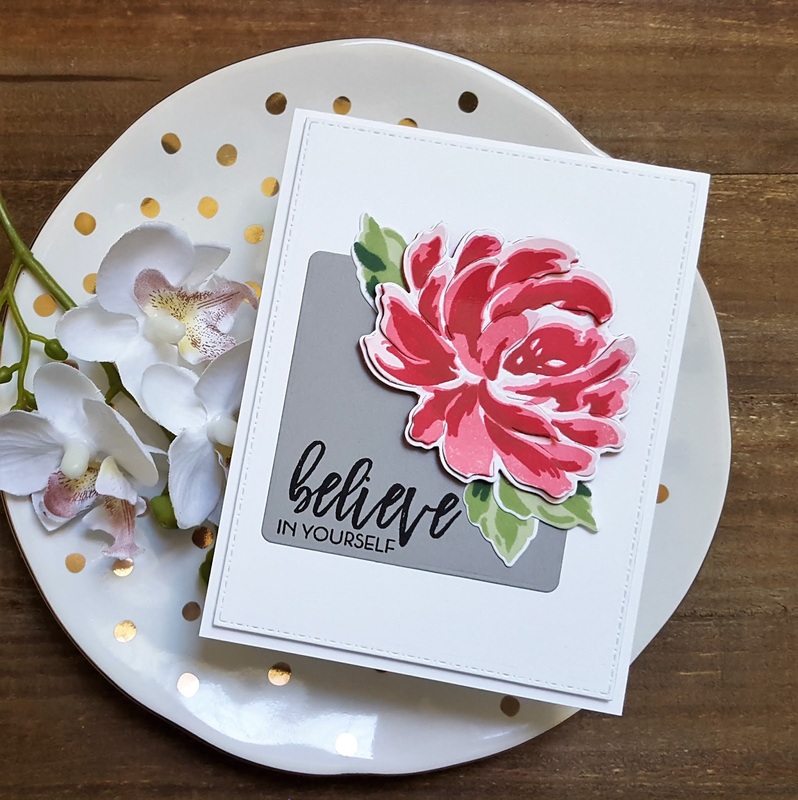 I used the MFT Sketched Blooms 2 stamp set for the floral images and the MFT Aim For the Clouds set for the sentiment. 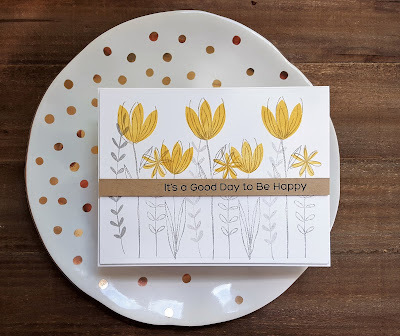 I started by stamping all the stems in gray ink and then added the flowers in yellow. 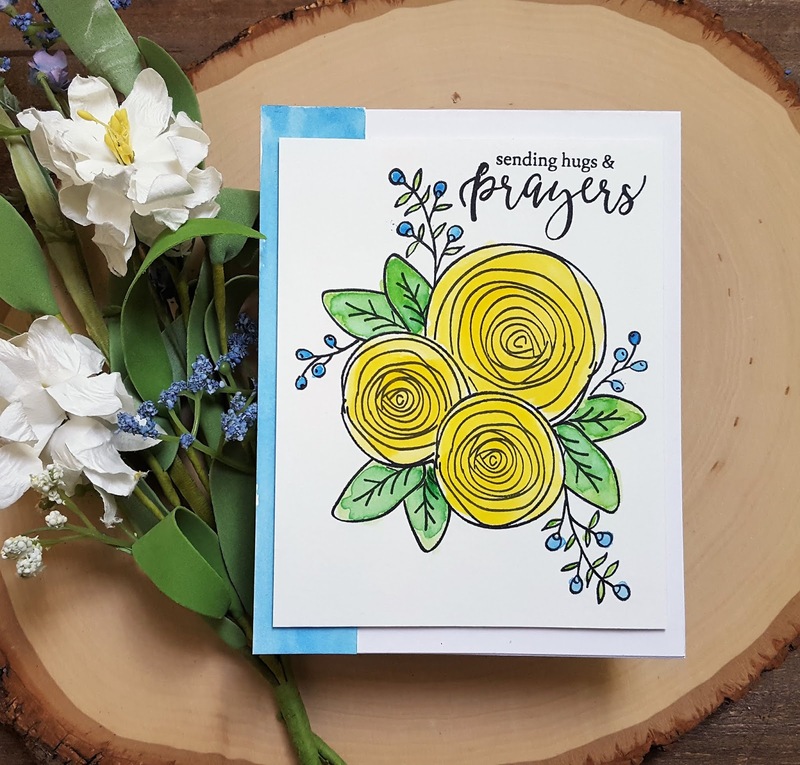 I accented all the flowers with coordinating images from the set using kraft colored ink. The panel was die cut and adhered to a white cardstock base. I stamped the sentiment on kraft cardstock with black ink, trimmed it down to fit my panel and then adhered to my card using foam squares. I am also going to add this to the Simon Says Stamp Wednesday challenge of the fun in the sun since flowers are found out in the sun. I think I may have given you a pretty good idea of what is going to be on the card, lol! I hope that you will head over to the AJVD blog to see the full card and to let me know what you think! Have a wonderful day! Hello! I hope everyone in the US had a wonderful 4th of July! We had a pretty nice one. The weather was typical for the Pacific Northwest in early July... cloudy and a little cold. But that didn't stop the lighting of fireworks at our house or in our neighborhood! Love 4th of July and what it means, but glad all the explosions are over for another year! I recently received the Simon Says Stamp July card kit and it is jam packed full of fun products and a fabulous stamp set. When I saw the kit I had to get it because of... flamingos! I love flamingos and the stamp set included in the kit has a fun flamingo image as well as a die to go with it. Shortly after the kit arrived I decided to stamp most of the images from the kit on watercolor paper and colored them with my ZIG markers. I then trimmed out the ones that don't have a die (hoping that SSS will make dies to go with the rest of the images!). After I had done that I set everything aside because I had other things going on and no time to do any crafting. When I finally got some time on 4th of July to put some cards together the new color combo from Color Throwdown was up and I decided to color a two more flamingos to use on a card for that challenge. 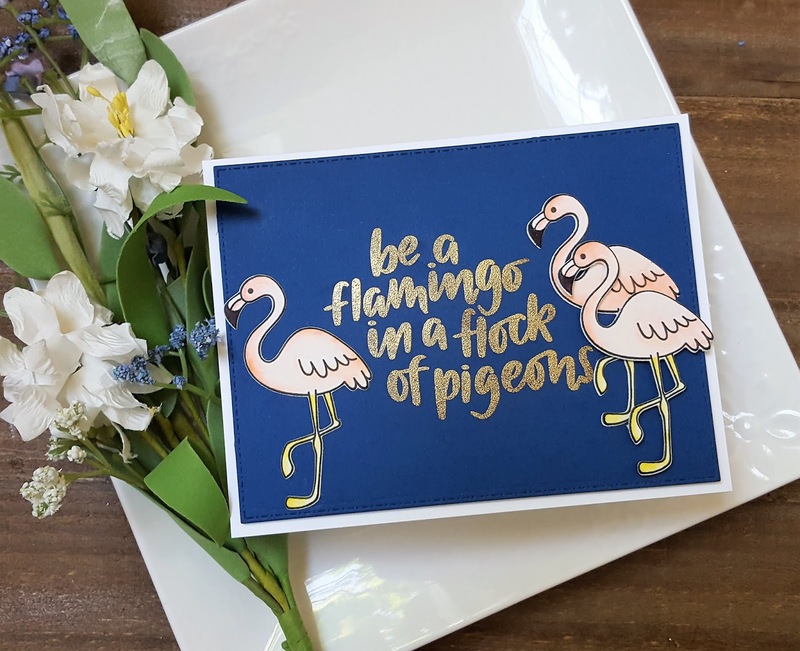 Once I had the flamingos colored and die cut I die cut a panel of navy blue cardstock and then stamped it with the flamingo related sentiment on the cardstock with watermark ink and then heat set it in gold. 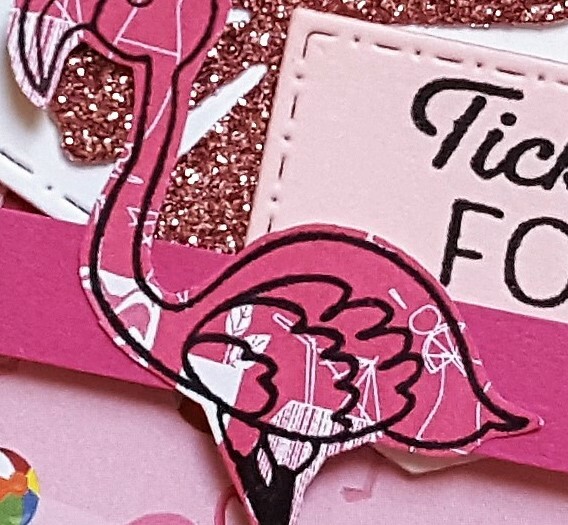 I arranged the flamingos and then adhered my panel to one of the white cards included in the kit. This next card isn't for anything in particular. 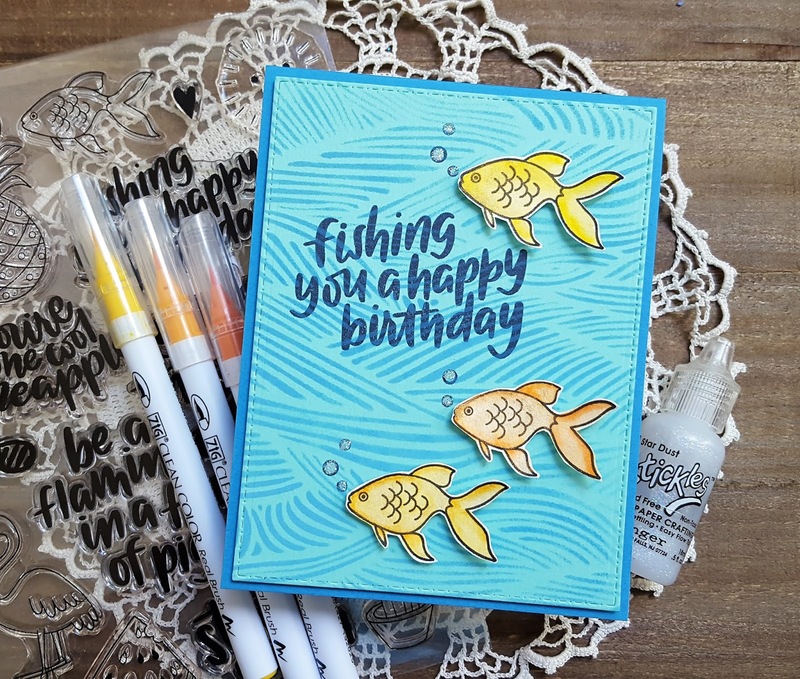 I just wanted to make a card using the fish image and that punny sentiment that goes with it. Once I had the fish colored I used one of the gold watercolors available in my Kuretake Gansai Tambi watercolor set to sort of dull the color and give them a hint of gold. 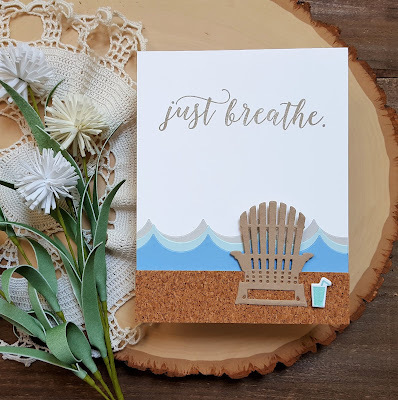 To create my "water" background I pulled out a stencil from Hero Arts and Salty Ocean and Broken China distress oxide inks. I had a piece of aqua colored cardstock floating around so I used that and stenciled on the waves. Once I had the background stenciled I die cut the panel and then arranged the fish. 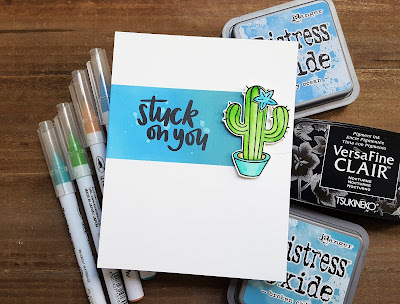 The sentiment was stamped using VersaFine CLAIR ink in Midnight. I love the way that you can still see the stenciling through the dark blue ink. I stamped the little bubbles at the same time I stamped the sentiment. The fish were adhered and then I added some Star Dust Stickles to the bubbles. 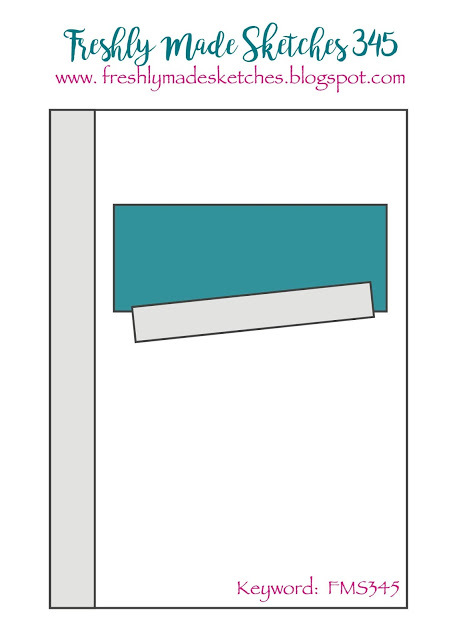 The panel was then adhered to a teal cardstock base. 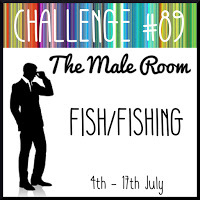 I'm going to add this to the current challenge at the Male Room challenge as their theme is fish/fishing. 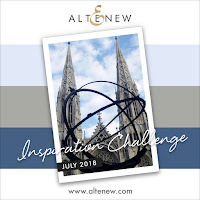 This is my first time playing along with this challenge and found out about it through Instagram. The final two cards came to be after I saw the current layout from CAS(E) this Sketch. I made two white cardstock bases and then using the grid on my craft mat I masked off the area on each card base and inked up one using Broken China and Salty Ocean and the other using Squeezed Lemonade and Wild Honey. 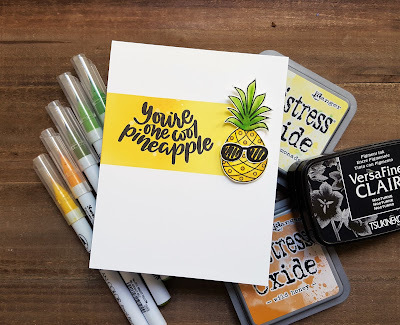 I had already colored the pineapple and cactus so I simply stamped the sunglasses and the little flower added a little bit of color to each, trimmed them out and then adhered them to their respective images. I splattered on a little water and once that was dry I stamped the sentiments using VersaFine CLAIR in Nocturne. The images were then popped up on the card bases with foam adhesive. Super simple, but rather cute don't you think? 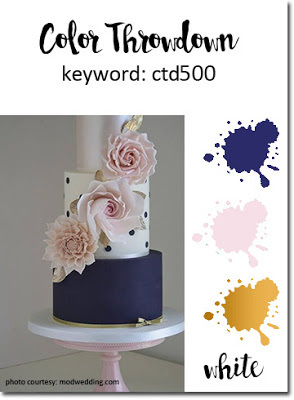 I'm going to be honest and admit that while I love the stamp set I initially was stumped by how I was going to use it and that is why I decided to first color up some images and see where they would take me. wednesday with ajvd... happy 4th of july! Have a wonderful and safe 4th of July! 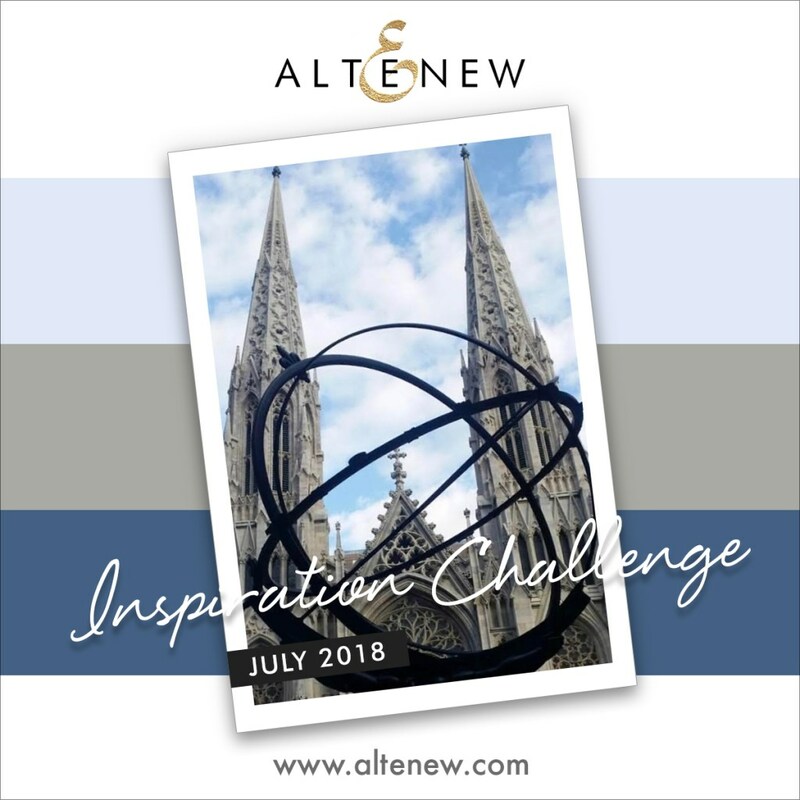 I hope you will take some time to head over to the AJVD blog to see my entire project and to let me know what you think. Hello! 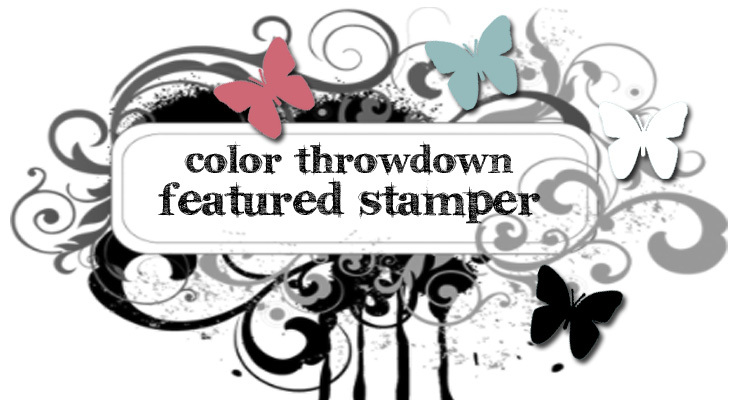 Popping in with a card for a few challenges: Color Throwdown, Freshly Made Sketches and Simon Says Stamp Wednesday challenge. Feels like I haven't played along with any challenges in ages, but that really isn't the case. Just haven't posted much on my blog, I guess. 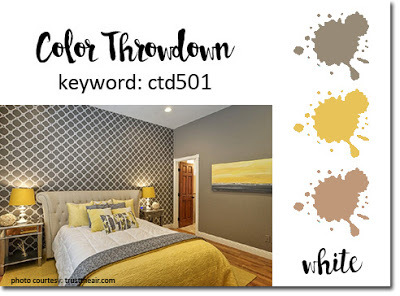 Love the pretty palette over at Color Throwdown and just had to make something. I pulled out the pretty Simon Says Stamp Sketch Ranunculus stamp set and did a lot of stamping and masking. The ink I used is my favorite black ink VersaFine CLAIR Nocturne. 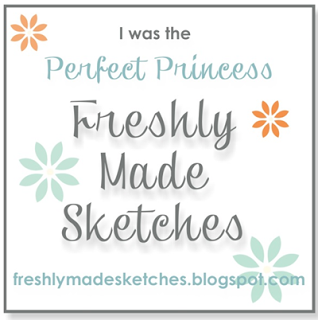 Love how beautifully it stamps... even on watercolor paper! Once that was done I did some simple watercoloring using my Kuretake Gansai Tambi watercolors. When the piece was dry I trimmed it down to fit the FMS layout. To bring some additional blue into the card I watercolored a strip of watercolor paper with the blue I used for the little berries. Because of the way I stamped the flowers and leaves I decided to flip the sketch on its side. Not super happy with where I had to stamp the sentiment, but that is the spot where it fit the best. 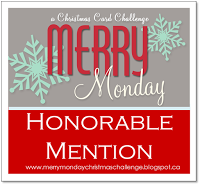 Think I will add this to Simon Says Stamp's Work it Wednesday, too.